In recent years "Used Oil Analysis" became a part of preventive maintenance program of many commercial and industrial entities like power plants, manufacturing plants, trucking companies, cab companies, construction equipment companies, etc. VISIT BLACKSTONE-LABS HERE. THEY ARE TRUSTED AND OUR RECOMMENDED USED OIL ANALYSIS GROUP. Cost $25 for standard test. Q.) What is "Used Oil Analysis? A.) sample of used oil is taken out of an engine (transmission, or other equipment) while it is warm and is put in a special analyzer that analyzes the oil for the following data. Why concentration of metals? Different components within an engine, transmission or equipment are made of different metal alloys. For example, some engines may have bearings that are made of alloys containing copper, chromium and lead all combined. Every such component has a normal amount of wear which is accumulated over time from a statistical data of used oil analysis for that specific equipment. When used oil analysis indicates higher concentration of these metals than expected in specific make and model of the equipment under test, this may be indicative of a beginning of mechanical problem that most of the time can be fixed easily before a catastrophic failure and irreversible damage occurs, thus saving thousands of dollars on unnecessary repairs and downtime. 2. a. Viscosity: a parameter which indicates the condition of a fluid as a lubricant. b. Viscosity Index: a parameter that indicates how well a lubricant behaves in certain range of temperatures. The lower the Viscosity and Viscosity Index compared to these parameters in new oil, the more the oil deteriorates in performance as a lubricant. This deterioration is caused by combustion gases that penetrate the oil system, metal particles that get into the oil as a result of the wear process, and shear and thermal breakdown of the oil. 3. TBN (Total Base Number): indicates the extent of motor oil oxidation. The lower the TBN the less ability it has to neutralize acidic compounds and more likely to be corrosive. The acidic compounds are caused by combustion gases that penetrate the oil system and metal particles that get into the oil as a result of wear process. When the TBN number is lower than 2 it is recommended to replace the oil. This tested data is compared to a data base of test results that were accumulated over the years for the specific equipment (model and make) the condition of which we want to establish. How can used oil analysis can help you see the difference in performance between lubricants that contain Polytron MTC additive package and those which do not? Together with the used oil sample also submit a sample of original clean oil to be analyzed as a reference, because there are some elements that are part of an additive package of motor oil that have to be counted out when interpreting the test results. 2. 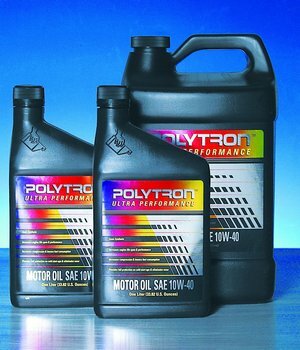 Change the oil and add to the new oil 10% of Polytron MTC (or use Polytron motor oil). After 500 to 600 miles change the oil and oil filter again and add 10% Polytron MTC (or use Polytron motor oil). 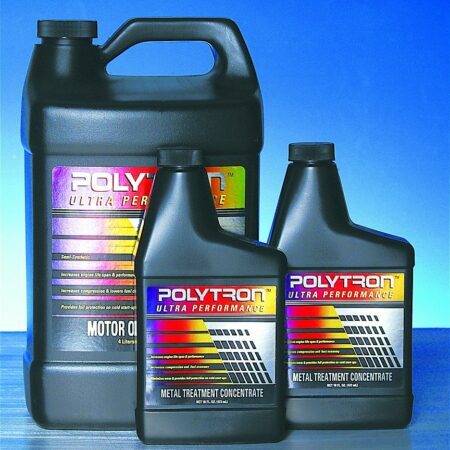 The reason why we recommend to do that is as follows: Since Polytron MTC has very powerful cleaning ability, it dissolves all the build-up on the engine parts and suspends it into the oil. Since the build-up contains wear metal, when Polytron MTC is used for the first time, oil analysis most likely shows sharp increase in concentration of wear metals, which may be wrongly interpreted as excessive wear due to use of Polytron MTC. The older the engine the longer the clean-up process takes. At the end of the cleaning process your equipment is ready for a comparison test. 3. After the cleanup stage referenced above, replace the dirty oil with clean oil (same make of oil that was used before) and add 10% Polytron MTC by volume. 4. Every 5,000 miles, take a sample of used oil (in stationary large generators, take sample every 250 hours) for used oil analysis and compare the test results to the "Base Line" test results referenced above. If the tests show considerable reduction in concentration of wear metals and no indication of engine problems, you can increase the oil change intervals and lower the frequency of used oil tests. 4 to 7 times lower concentration of metals (which means at least 4 to 7 times reduction in wear). Viscosity, Viscosity Index and TBN are maintained at their acceptable level 4 - 7 time longer, which means that the oil can serve 4 - 7 times longer, extending maintenance intervals 4 to 7 times. Lower fuel and oil consumption (based on records prior to using Polytron). Q.) Why 4 – 7 times lower concentration of wear metals ? A.) Polytron MTC penetrates the metal structure at its friction surface and converts a very thin layer of original metal into a much harder metal that wears out 4 – 7 times slower. Thus “used oil analysis” will show at 4 – 7 times lower concentration of metals. Q.) Why 4 – 7 times longer service life of motor oil ? Penetration of combustion gases from the combustion chamber into the oil through the clearances between piston-rings and cylinder-walls. 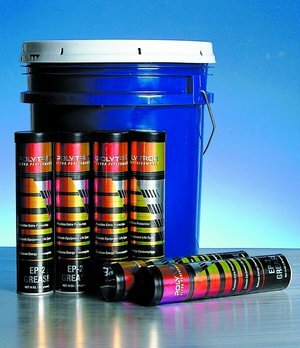 Increased concentration of metals in the lubricating oil as a result of the wear process. As a result of these two main problems, in addition to oil deterioration in performance, over time a hard build-up is formed on engine parts like piston rings and pistons, which contributes to accelerated wear and deterioration in engine performance. The effect of these two problems is drastically reduced in the presence of Polytron. 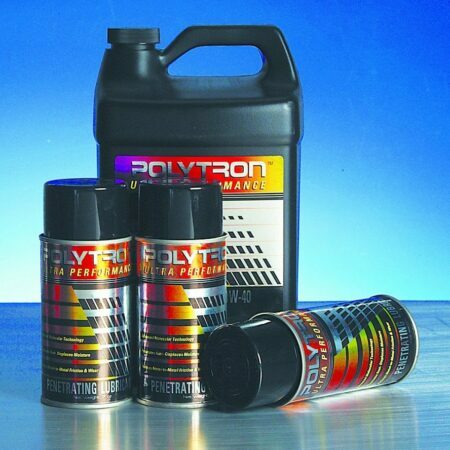 Polytron dissolves the build-up and varnish and cleans the engine parts including the piston rings, releasing them to operate properly. The metal friction surfaces are “polished” and become much smoother. As a result of the smoothing effect the clearances between the cylinder walls and the piston-rings surfaces become much tighter, resulting with a tighter seal, which prevents penetration of combustion gases into the oil system. (c) Copyright. 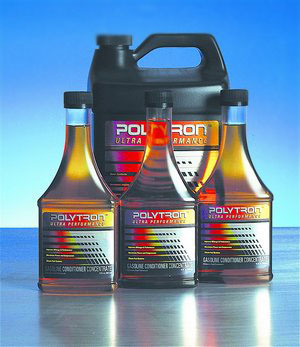 Polytron Direct - ultra performance Lubricants and Oil Additive products online store.